Despite all the advances in technology of the last decade, batteries are still shockingly bad – taking up the bulk of most modern devices and rarely lasting a full day of use. Which is where whopping great external battery packs like the Poweradd Apollo Pro come in, with automatic solar charging and 23,000mAh of power – or about 3.5 iPads worth. I’ve been putting one to the test. And today, we’ll be offering it in our giveaway! The Poweradd Apollo Pro costs $110. If your interests lie solely with solar charging ability and not a battery pack, the Anker 14W foldable USB charger will perform better, at only $70. Poweradd also offer a smaller form-facter, 10,000mAh model for $45, more suited to small devices like an iPhone. EC Tech offer a similarly sized battery pack (22,400 mAh) for $50, though without any solar charging abilities. Our purchase was supplied with a free carry case separate to the main package. This thing is heavy at just over 1.3 kilograms in the box, and not much lighter when out of it. Orange accents seem to be the accepted colour scheme for anything ruggedised, like these hard drives Lacie Rugged Mini vs. AData DashDrive Durable: A Comparative Review and Giveaway Lacie Rugged Mini vs. AData DashDrive Durable: A Comparative Review and Giveaway Electronics of all kinds aren't really built to withstand much in the way of knocks or extreme weather, but a special breed of portable hard drives exists to serve this very purpose - to withstand... Read More , though the bare unit would scratch easily outdoors. Inside the heavy pleather case it’s even bulkier, but resistant to scratches. The ports are left easily accessible and there’s no screen protector, so thats left exposed to possible damage. 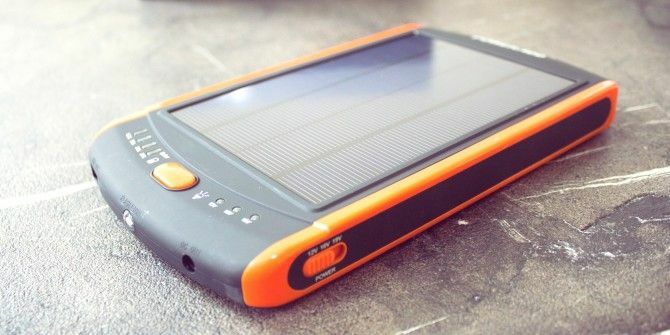 It seem like a basic plastic screen cover built into the case would increase the durability outdoors significantly without detracting too much from the solar charging. A ridiculously large number of power adapters is supplied for every DC power jack known to humanity; these are used for laptops, or generic 12V input like an Arduino. On the other side is a USB port, with an extendable cable supplied and adapters for mini-USB, micro-USB, and an old style Apple 30 pin connector – yet curiously not the new Lightning connector. Since it’s a standard USB port, you can just plug your own adapter straight in – the supplied mini cable is just for convenience. An AC power adaptor is also supplied for charging the battery from a wall plug, in case you live somewhere like the UK where the sun rarely shines and all solar devices are essentially rendered useless. The USB charger heads and cables aren’t interchangeable with the DC jack – which is a good thing, because you’d fry your mobile devices if you pumped 12V into them, which is what the DC power is designed for. A simple slide switch changes between 12C, 16C, and 19C, for charging larger devices like laptops. No AC power socket is available. Here’s the full list of the more obscure DC plugs supplied. Although it’s rare you’d need anything other than a single adapter, it would have been nice if the supplied carry case had room for all the adapters and cables too; this seems a common feature on the foldable solar panels. A single click of the bright orange button displays the current charge level – it’s supplied fully charged. Hold down for a longer time on the button and the front super-bright white LED is activated – not that I can see anyone wanting to use this hulking beast as a wieldy flashlight, but it’s useful for emergencies. A full charge of my third-generation iPad took just about 6 hours; the Nexus 7 took about 4 hours; my iPhone 5s took about 2 hours. After charging both the iPad and Nexus, the battery was showing a 25% charge left, which works out roughly with stated battery capacities of 11,560 mAh for the iPad, 4,235 mAh for 2012 model Nexus 7, from a total 23,000 mAh in the Poweradd Apollo Pro. The unit can be charged either from a wall plug, with the full battery replenished overnight; or can be trickle charged from solar. The problem with the solar charging is that it doesn’t appear capable of charging the device once the battery has dropped to 50% or less. I suspect this is because the small solar panel just doesn’t have enough oomph (that’s a technical term) to kickstart the battery charging process, even in bright sunlight – so relying upon this for an emergency situation where there’s no wall outlets available probably isn’t a good idea. Batteries requires a large voltage for the initial stages of charging; later, a smaller charge is all that’s needed, at which point the solar cell can handle. As far as I can tell, this isn’t confirmed in the product literature, so it may be the case that our British springtime sun just isn’t strong enough. Here’s where I hit a snafu: I own a MacBook air, which can’t be charged with the Apollo Pro due to the lack of MagSafe adapter. In fairness, this is Apple’s fault and not Poweradd’s — they make non-standard power cables with tiny micro-circuits in them to prevent third party devices from working without a licence. It’s a part of the Apple tax, but it does somewhat limit the usage of these niche power solutions. Regular laptops and anything that charges from USB will work fine. In practice, I was able to use the solar panel to keep my iPhone charged for a week without requiring any external input. Once I tried to charge a tablet as well, the battery depleted to 50% and solar no longer seemed to replenish any charge. In terms of usability, I was expecting to have to switch modes between charging or discharging – that’s not the case. Solar charging occurs automatically when placed into sunlight. Charging a device requires a single push of the button; and solar charging/battery discharging can be done simultaneously. The only real setup you need to do is ensuring the correct DC voltage is set for your laptop. Should you buy the Poweradd Apollo Pro? I’m in two minds about the Apollo Pro. On the one hand, my dreams of running away to live off grid or survive the zombie apocalypse have been thoroughly dashed; this battery will need a wall socket to fully charge – the solar is just an added extra that will prolong its life as long as you don’t use it too much at a time. On the other hand, 23,000mAh is a truly monstrous capacity that, in practice, will provide a full charge for an iPad, a Nexus 7, and a mobile phone – which could make all the difference if you’re stranded in your car or otherwise; and the ability to run other DC devices that require higher power is a great addition. MakeUseOf recommends: As long as solar charging isn’t your priority, the Poweradd Apollo Pro is great external battery pack. For purely solar charging, look elsewhere. How do I win the Poweradd Apollo Pro? This giveaway begins now and ends Friday, May 9. The winner will be selected at random and informed via email. View the list of winners here. Congratulations, Gareth Howe! You would have received an email from jackson@makeuseof.com. Please respond before May 22 to claim your prize. Enquires beyond this date will not be entertained. Explore more about: MakeUseOf Giveaway, Solar Energy. This would look great on the dash of my car! Yes...for batteries, bigger IS better! Bigger is better. 23,000 mAh is about right. Bigger is better if and only if it's portable/handy. Optimal External Battey Pack capacity is 23000mAh. No bigger is not better. Smarter is better. almost the moment of truth now for the raffle.... crossing fingers to win this one. I would leave it in my car. I want portable & powerful. Bigger is better as long as it's not too heavy/causes issues. No, since I don't need to power many devices I would rather have a more portable one. I can't help wondering why the solar doesn't work at the 50% mark. I would think this device would be much more useful if that wasn't the case. In my opnion Bigger is always better . And same applies for external battery pack capacity. Something that can power my entire house. That is the ideal size. It depends on the use case. For this one bigger is better. I figure I would leave it on the dashboard in my car and just grab it when I need it. 20k - 30k mah capacity? Enough to charge my laptop. I am constantly in remote areas without access to power to charge my phone or laptop. If I have enough for that then it would all be good. I don't think bigger is necessarily better. It's about how efficient the battery system is. More is better . 10000mAh at least . When it comes to external battery packs (preferably solar), bigger is better in the capacity sense—I want to be able to collect all the charging power I can, but bigger is definitely not better in the physical size sense—I want my charger to be as portable as possible. Because those two wishes seem to contradict one another, each buyer needs to strike the balance where it suits him/her. Bigger is not necessarily better. If I can get 8-12 hours, I will be happy. I think bigger is usually better especially for external batteries. I think 8-10.000 mA is ok.
size not withstanding, I would use the hell out this. bigger is better! 10000mAh works. I find that 1700mAH lasts my iPhone 5s through the day without needing to compromise on portability. Bigger is better. 23,000mAh is sufficient. 6,000 mAh. Enough to jump my car battery. Giving out current in 1?, as well as having capacity from 12 000 up to 16 000 ??? bigger is better. currently thinking 10000 mah was optimal for mobiles. I kind of like this idea. Certainly glad you stated it wasn't a "survivalist" tool. :) Yes, in some cases, bigger is better but you then have to consider the weight as things get bigger. James mentioned that it was heavy and, since I live in the U.S. and not a metric guru, I have no idea what that weight. It certainly looks heavy duty and if I am out and about, it would definitely come in handy to charge my iPhone. Bigger is not always better, it will charge an ipad and a iphone which I think is good. Depends on what you use it for. For your phone, 3-6k is enough. But if you're planning to go off the grid for a week or two, 23k solar charger is great. The solar charging needs a higher capacity though imo, as you can't always expect it to be sunny (at least not where I'm from). Yes, I always feel bigger better. So far I have a 12000 one. Definitely its better if its bigger. However, this seems to be like the optimum capacity that should be sufficient enough. Bigger is always better, as long as the pack doesn't grow to a stupid size, it needs to stay easily pocketable . Finally her is a product that let's you used your electronic goods while not harming the environment. It certainly seems powerful enough, and here in Africa there is more than enough sun to charge it up for my goodies to use! Around 5000mAh for tiny chargers, I guess? As big as possible for zombie apocalypses, lol. bigger is usually always better. The size doesn't really bother me as long as it gets me out of a pickle when it needs to. 23000mAh is plenty sufficient for my needs. i have an iphone to charge! More is better especially if you have more then one device. 12 to 15K mAh should be enough for me. Maybe 20,00 but then if it's a solar it must be able to recharge and sustain itself. WOW, power for the tech toys and Portable! bigger is normally better but it still has to be portable enough. More is better! 25K is great! Bigger is better. 23,000 is good. I usually want as much as I can carry. The bigger the better. But the device must still stay enough portable, not becoming a huge and heavy box. 20 000 for me is more than enough, optimal. Bigger is better in this instance and I think 23,000mAh is optimal. Bigger is better - usually. As you stated "23,000mAh is a truly monstrous capacity" and "In theory, a full charge of the battery will take 24 hours of optimal sun (15V 230mAh solar cell, for a 23000mAh/85Wh battery capacity)"
I don't know for both. Bigger is definitely better; I'd rather have the juice I need and have to carry a little more weight. Bigger batteries are not necessarily better or needed but optimal is 23000mAh/85Wh. Bigger is better but has to be lighter as well, I think 20000mAh is the optimum capacity. The external battery pack capacity is 23000mAh/85Wh. No idea how much, if talking about duration capacity, an external one should last 1 week. Bigger is better if the word is about the capacity. The external battery pack capacity is 23000mAh/85Wh. Bigger is better. That looks portable. I can carry that in my bag back and charge my devices when necessary. Bigger is better not sure what is the optimal. I would say anywhere around 21-23k, even 25k would do to power multiple devices for 24 hours. This Apollo powerbank looks nice! Smaller size with more capacity will be better. I think 23,000 mAh is pretty good. I can charge my phone for almost two weeks ! Yes Bigger is always better. 10k mah charger will be sufficient for me. bigger is always better so my wife says. This is a subjective question? Depends on what you're doing with it, right? All I know is I think this is a neat unit, even if you do have to have it at 75% before it will charge appropriately on solar only. Weight, size and number of devices to charge. there is no optimum, minimum maybe.. Depends entirely on the number and type of devices to be used with it. 10000 to carry daily, bigger for something for long trips. I have an 8,800 mHa battery on my laptop so anything over 20,000 mHa is a good balance between charge time and use. For my use, a 10000 would be great for daily use, but this is perfect for longer trips. I need one of those. Awesome piece of gear. It all depends on the number of devices and length of time you will need an external power source, but more capacity equals longer time you have power. 23000 mAh sounds good to me. It'll keep everything running for a long time. Bigger is always better. 23,000 is the highest I've seen. Yes bigger is better. Optimal Battery Pack capacity depends on the devices you have and how often you are in situations where you need external power supply. Optimal capacity depends on what devices you own and how often you need external power. With a 23,000 mAh unit, I would be happier than the Geico pig after winning the lottery! Already have a 40w solar panel need more as I go camping for a week at a time. The capicity of this battery sounds great, but must be balanced against weight. If it's not light enough to take with you, it will never get used. As long as the battery pack remains easily portable, there is no optimal capacity. Just keep them coming as long as they don't reach the size of car batteries. I want them in a book bag, not a tool cart. I like this one. Bigger is not always better and the optimal external battery pack capacity is dependent upon how much you'll use it. Obviously bigger is better. But the hefty 23,000 mAH storage comes at a hefty weight penalty. I'd recommend that you get storage capacity that is commensurate with the devices you want to re-power and the length of time that you anticipate being away from "shore" power. I don't normally need 23,000 mAH of power (unless I want to jumpstart my truck), so I'd be more comfortable carrying 10 - 15,000 mAH at a max. 23.000 mAH is actually quite a lot, but I can defintly see the use of it, for example on long trips in the mountains or while using multiple devices. External chargers are very good but bigger means more awkward. I'm sure there's a balance. Optimal Battery Pack capacity depends on the devices you have and how often you are in situations where you need external power supply. In my case I use only my Nexus 4 when I'mm out, and for a maximum of couple of days at a time. So 10,000 is enough for me. But then again if I had a 23,000 mAh unit, I would may be take along my tab and laptop too without second thought! Ha! Capacity/size as a factor depends on the situation or devices being charged. For me at least, the ability to charge a phone and tablet would be quite sufficient enough for me for a battery charger I take with me on a daily. Even then, I hardly use it. 23000mah is massive but I could consider it for some situations. 23000 mHA is nice for me. I think bigger is better. I can always use more power so I dont know a top limit. I would say that 23000 mAH is big enough. Bigger not always better. Bigger isn't always better, more power in a smaller size would be better. I only use it to charge my phone just in case. So, 8 to 10k should be more than enough. And I want the smallest that can hold that capacity. Yes, it's better. I think 20.000 is enough. This size certainly seems big in comparison to others, but as long as it would extend a laptop's battery life by at least another 2 hours, I think it would be doing a good job. Bigger is better up until it needs to be on wheels to move it around. 20.000 mAh and more is a very good capacity. In general, bigger is better. But not always. For me bigger or smaller doesn't make the product better. This is pretty great! Like how much space it has, and is a nice option to charge some with solar power. A 23000mAh battery is quite nice but the sheer weight and size if the device is not very "portable". It's a nice battery pack to carry with you on a trip but not really portable enough for everyday use. For me around 23,000 mAh is the perfect capacity. If it is supposed to be portable, then bigger is not always better. For physical size, this solar charger would fit easily on a window sill to get access to outside. If it was too big, there would be risk of it falling off. Optimal charging capacity... enough to fully charge two smart phones. If I needed more than that, carrying extra batteries would be more efficient. As long as it would fully charge my device it doesn't matter, though at least 20000 would maybe allow me to charge my phone and my camera! 23000 mAH, the bigger the better! Bigger is better until it gets too heavy to carry around easily. Of course, bigger is better! A 23,000 mAh battery would do! The bigger the better, but the bigger the heavier. So, I prefer around 5800 mAh which makes it useable and transportable. I hope this will work to charge my Sony VAIO laptop. Thanks! Well, probably, but at some point, portability might be a consideration. 23,000 mAh will be perfect! When you're working with a bunch of electronics and need to keep them charged, you can never have enough battery power. Yes of course, bigger is better! I'd go for a 23,000 mAh battery! I think the optimal charger would be a good combination of stored power and a solar charger that is capable of charging the battery in the charger as well as direct solar charging for your attached device. Bigger is better! More than 20000 mAh! Bigger is better!! I prefer over 20000 mAh. 23k seems a bit excessive but I'll accept a free unit without issue. 23,000 mAh will do just fine. 23, 000 mAh is ok for me. Its just awesome , and in this case , the bigger the better. Well, if it could also provide an emergency boost when my wheelchair runs out of juice, that would be great (but probably be WAYYYY too heavy!) Seriously though, being able to extend a tablet by a few hours would ensure being able to get through the day. I'm sure bigger is better. Many of us use not only one device/gadget to this big capacity is enough. for heavy use laptops / tablets bigger is needed for road warriors. Bigger is better, but as to the best capacity, that depends on how heavy a battery pack you're willing to carry. This one weighs considerably more than a 10 inch tablet, so it's probably pushing it. Bigger capacity is almost always better. The optimal capacity is the capacity that'll bring my phone, tablet, and laptop to full charge after they were fully depleted. I don't know but this sounds like a good start. Yes, big is better. As to how much the optimal capacity is, it depends on how large you can get w/o making it too large and bulky. Big is good, and not sure about the second question. Can never have enough juice. What most have already stated; never can be big enough. Twice whatever you think you think you need ? I like biggest capacity balanced with portability and lightweight design. Depends on the use - the biggest possible for my emergency bug-out bag; a smaller one for regular travel and day to day use. NO more charging the portable charger!!! I really have only ever needed 1 extra charge at a time and being able to throw the external charger in my bag without it taking up much space is a plus. This guy is looking a little bulky to me. In battery capacity bigger is always better.